On January 15, 1908 on the campus of Howard University in Washington, D.C., Alpha Kappa Alpha Sorority, Incorporated® was established as the first Greek-lettered organization for black college women. Founded by Ethel Hedgeman Lyle and fifteen other ambitious and dedicated women at Howard University (pictured top right), Alpha Kappa Alpha Sorority was formed to foster high scholastic and ethical standards, promote unity and sisterhood, and improve the social stature of African-Americans. Alpha Kappa Alpha's influence extends beyond college campus quads and student interest. It has a legacy of service that deepens, rather than ends, with college graduation when members join graduate chapters. The overarching goals of Alpha Kappa Alpha's program activities center on significant issues in families, communities, government halls and world assembly chambers. Its efforts constitute a priceless part of the global experience in the 21st century. Over one hundred years after its establishment, Alpha Kappa Alpha has blossomed into a sisterhood comprised of nearly 300,000 college-trained women in over 1,000 undergraduate and graduate chapters throughout the United States, the Caribbean, Bermuda, Africa, Canada, Europe and Asia who believe in "Service to All Mankind." 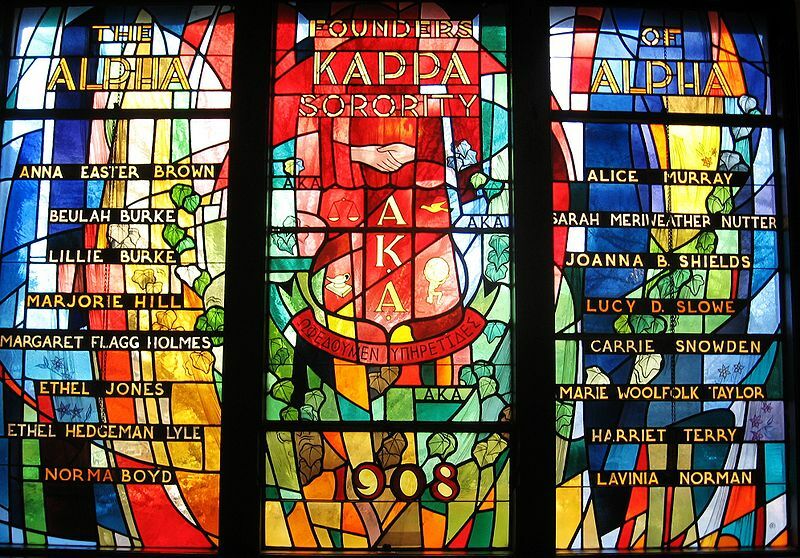 The Founders' Window (pictured bottom right) was produced by an Alpha Kappa Alpha Sorority member and internationally renowned African-American artist, Lois Mailou Jones (1905-1998). Dedicated in 1978, the three-paneled stained glass window commemorates the sorority's founding and memorializes its founders. Founders' Window is located at Rankin Chapel at Howard University. To learn more about Alpha Kappa Alpha's history, visit www.aka1908.com.